As a busy parent, putting food on the table every day shouldn’t be stressful. There should be an easy way to feed your entire family healthy and nutritious meals without spending hours in the kitchen prepping, cooking, and creating tons of mess that has to be cleaned up afterwards. Luckily, there are plenty of kid-friendly meal delivery services out there to come to your rescue. In fact, there are options designed specifically for babies, toddlers, and kids as well as ones that are suitable for feeding the parents as well! There’s a chance you may know this meal delivery service from their appearance on the popular TV show “Shark Tank” (see in the video above). Designed for children ages 1 to 12, Yumble Kids provides perfectly portioned meals without the hassle of cooking or creating a mess in the kitchen. Based on what we can see from their current menu options, even the pickiest of eaters will appreciate the meals that Yumble Kids has. Plus, it keeps parents happy since they’re made with health and nutrition in mind. On the menu, you’ll find all sorts of unique options. There’s Chicken Pops & Mash with mashed potatoes and green beans, Mac and Trees with parmesan broccoli, Mighty Meatballs with basmati rice and honey glazed carrots, and the Pizza Pocket with cheddar cheese mashed potatoes and broccoli. The best part is each meal simply needs to be heated in order to enjoy them. However, the part your children will love the most is what’s included inside each box! You don’t just receive meals. You’ll also receive a welcome pack upon subscribing that includes crayons, coloring sheets, and a star chart for children to track their weekly meals. Every delivery after that will include collectible coins, which can later be traded in for fun prizes. But if you’re feeling a little jealous that you might be too old for Yumble Kids, that’s not the case! Older children and adults can enjoy it too, but it’s recommended to order extra meals each week since serving sizes are smaller. If you’ve been on the hunt for healthy, organic food for your baby, you’ll want to check out Little Spoon. To get started, all you have to do is a take a simple quiz to discover the recommended “Babyblends” for your little one to enjoy. Then, you’ll be well on your way to receiving a selection of fresh, organic foods that are designed for your child’s needs. The options you’ll find from Little Spoon includes classic blends like Broccoli Spinach, Sweet Potato Carrot, Pear, Apple, and Mango. But there are more complex flavors like Avocado, Green Apple, Broccoli, and Spirulina or Broccoli, Pineapple, Banana, and Hemp. You can also search flavors based on the health benefits each one provides, such as brain, bone, digestion, eye, immunity, or muscle. Little Spoon uses over 80 organic ingredients to create each Babyblend, so you can always feel confident your child is getting a quality meal. 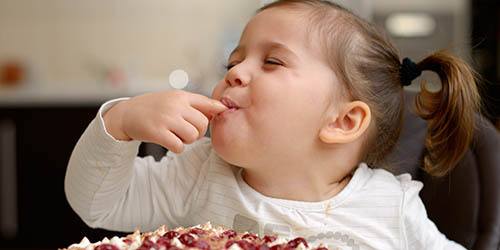 What’s more is that these foods expose little ones to a wide range of ingredients to expand their tastes while still getting a balanced diet. With Nurture Life, your can receive ready-to-eat meals that are suitable for babies, toddlers, and kids. Every meal is approved by a pediatric dietitian and prepared ahead of time by the Nurture Life team. The meals are then shipped directly to you and simply need to be heated in the microwave or oven when it’s time to eat. It doesn’t get much easier than that! When you join, it’s easy to find meals that are suitable for your children because you can narrow them down by age group (something not seen in other meal kits on this list). For babies, there are three different stages of meals. They include foods like Golden Delicious Apple for those four months and older, Banana, Raisin, & Oatmeal for eight months and older, and Braised Beef, Carrots, & Peas for babies 10 months and older. Toddlers can enjoy Chicken Meatballs with Pasta & Veggies, Honey Mustard Chicken, Minestrone Stew, and Turkey Tetrazzini. Then, there are meals for kids, which are also divided into age groups. Kids will find Pot Roast with Mashed Potatoes, Peas & Cheese Tortellini, Mac & Cheese with Cauliflower, Teriyaki Salmon with Brown Rice & Veggies, Veggie Tikka Masala, and the Beef and Lentil Casserole. Raised Real is another kid-friendly meal delivery service that’s specifically geared towards babies. If you’re looking for something other than what you’ll find at your local grocery store, this could be a must for you and your family. Everything is flash-frozen, organically-sourced, and developed by nutrition experts. Plus, they’re all plant-based as well. Once they arrive on your doorstep, you simply need to steam them and then puree, mash, or serve to your little one as finger food. It’s totally up to you and what your child needs! On their menu, you’ll find things like Peas + Zucchini with hemp hearts, basil, and avocado oil, Broccoli + Green Beans with chickpeas, flaxseed, and avocado oil, Spinach + Banana with quinoa, chia, and coconut butter, and Sweet Potato + Mango with coconut milk, lucuma powder, and chia seeds. Each order comes with meal cards that include a breakdown of ingredients, nutritional information, and details on how the food helps your baby’s growth. The team at Yumi prides themselves on delivering freshly made organic baby food that gets delivered to your home on a weekly basis. It’s healthier than many store-bought options, but saves you the hassle of making baby food at home. After all, that can be time-consuming and messy, which no busy mom wants to deal with. Everything on Yumi’s menu is organic, gluten-free, low in sugar, and packed with nutrients. As a prent, that’s something you can feel great about! Their rotating menu has blends like “Squash + Greens” that contains butternut squash, kale, quinoa, and flax, “Paw Paw” which has papaya, sweet potato, coconut milk, and banana, and also Garden Party that contains sweet potato, carrots, split pea, and apple. The great thing about Yumi is because of its variety, it introduces your baby to a variety of spices and flavors to expand their taste at an early age. Plus, the fruit blends are balanced with high-fiber ingredients, which is designed to stop sugar cravings before they start. If you’re ready to set your child up for a lifetime of healthy eating, it starts with what you’re feeding them as a baby. And if you’ve been searching for fresh, organic baby food options, another meal kit you should take a look at is Pure Spoon. Their baby food is USDA-certified organic, non-GMO, and gluten-free. Plus, their packaging is also BPA-free and recyclable! Pure Spoon is focused on using fresh ingredients, which means they make use of what’s currently in season. Once ingredients are sourced, the food is made by hand. There are no preservatives, additives, or colors put into their foods. Instead, they rely on High Pressure Pasteurization to pasteurize food without using chemicals or high heat that can remove the nutrients in the food. This ensure that the food is still healthy, but also free of potentially harmful bacteria. In their online shop, you’ll find Simply Pears, Simply Carrots, Sweet Potato and Apples, Creamy Avocado and Apples, and Creamy Avocado and Pears for babies who fall under stage one. Stage two babies can enjoy Blueberry, Banana, and Apples, Spinach, Pear, and Banana, Carrots and Zucchini, Apples and Broccoli, and Butternut Squash, Apples, and Oats. As busy parents, packing school lunches can be kind of stressful. Not only do you need to plan out the meals ahead of time and go grocery shopping… But then you need to prepare and pack the lunches each day! And let’s be honest, it would be fantastic if it could be taken care of for you so it’s one less thing on your plate. That’s where Scrumpt comes in! They’re helping to take school lunches to the next level with a main, fruits, veggies, something with a little crunch, and a delicious treat (if you want to add it). Their meals feature all-natural, organic, and sustainable products. Plus, the menu rotates every season with 45 different meals to choose from, ensuring there’s plenty of variety for picky eaters. They’ve also made it easy for those with food sensitivities because everything is peanut-free. Scrumpt also offers vegetarian, lactose-free, and gluten-free options! You can order meals like their Turkey Pretzel Slider, which features turkey on a Pretzilla Pretzel, along with provolone and vegan mayo. There’s also carrot and celery sticks to dip in hummus, as well as a mix of red and green grapes. Or you can go for the Chicken Cubes, which has chicken and cheese cubes, cucumber slices and hummus, and a fruit salad that contains red and green grapes and blueberries. 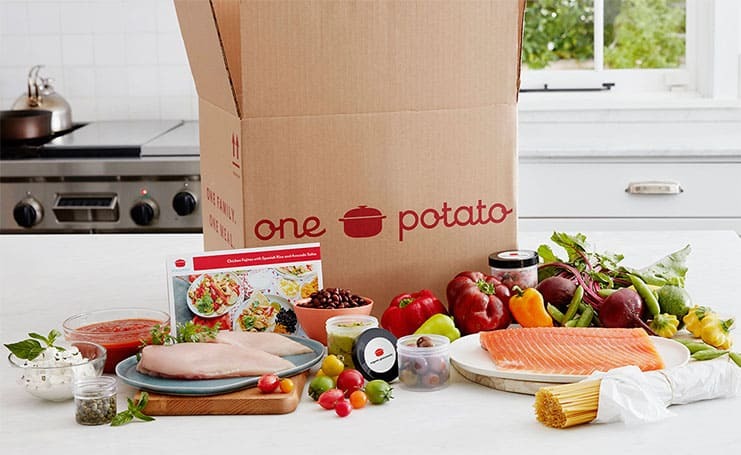 One Potato is one kid-friendly meal delivery service that’s actually suitable for the entire family! You’ll receive organic, pre-prepped ingredients, and a recipe to follow along with. The ingredients are delivered fresh to your door each week. It’s the perfect way to get in the kitchen with your family and have children get involved with cooking at an early age. But with everything being pre-chopped and pre-measured, it saves you some time and hassle. What’s more is you don’t have to worry about kids using knives to prep the meals, making the cooking experience a lot safer. Picky eaters will love the Classic Burger & Fries and the Herb-Roasted Chicken with Brussels Sprouts and Polenta Fries. Oh, and there’s free cookie dough in every box so you’ll also have a sweet treat to enjoy after dinner! Another option to consider is Gobble, which is designed to help you have dinner on the table in just 15 minutes. That’s a pretty impressive feat that any busy family is sure to love. While technically not made only for kids, Gobble is great because it enabled families to cook meals quick and get kids involved in the process (if you want to). Like One Potato, everything is already pre-chopped and pre-measured. Their weekly menu has all kinds of options, including some that are suitable for those who are gluten-free, dairy-free, vegetarian, or even low-carb. Dishes you might find are the Parmesan Crusted Chicken with Lemon-Basil Orzo Salad, Chicken Florentine Rigatoni Bake with Sun-Dried Tomatoes, Chicken Enchiladas Verdes with Avocado & Pinto Beans, and Pan-Roasted Chicken with Green Bean Casserole & Mashed Potatoes. Last but not least, Dinnerly is another great option you and your family will want to consider. Like Gobble, their meals can be made incredibly quick. Perfect for when you’re taking care of a family! Dinnerly keeps their meals very affordable at $4.99 per serving, making it great for those who are on a budget or looking to save money while still eating well. But if you’re worried about whether your kids will like the meals, just take a look at the menu. It rotates each week, but you’ll find things like the BBQ Cheeseburger with Sautéed Onion & Crushed Potatoes, Sticky Caramel Pork with Green Beans & Jasmine Rice, Chicken Sausage Meatballs with Mashed Potatoes, Peas, & Gravy, Beef Enchilada Casserole with Poblano & Cheddar, and the Crispy Fried Chicken Tenders with Green Bean & Corn Succotash. best for 5 year old? Is he/she a picky eater? You may want to look into Yumble.